Last week the Premier League published the first (sort of) detailed stats on their Fair Play League table. Quickly thereafter, all of the news outlets reports how Chelsea basically treats the refs like garbage. Anyone that watches the Premier League, even Chelsea fans, knows this is true. Don’t deny it folks! A table is great for ranking and looking things up, but terrible for doing any sort of analysis. I downloaded the FPL table into Excel (here) and combined it with the BPL standings as of the same date. 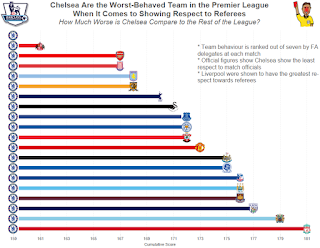 In the viz below, I’m using Chelsea as the baseline for comparison, because the story that interested me was how much worse does Chelsea behave compared to the other teams. 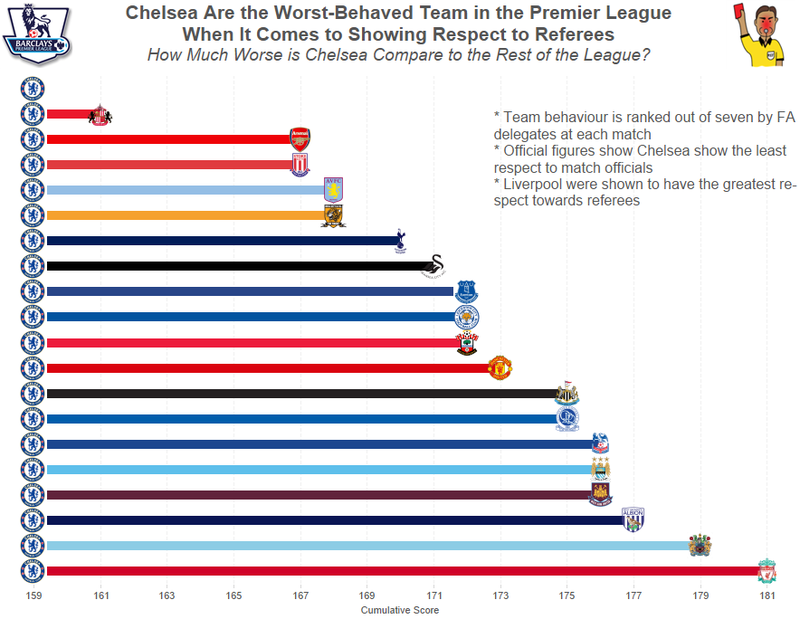 For example, if you hover over Liverpool, you will see that Chelsea is 14% worse with its respect for referees. I then added a second tab that allows you to explore the data on your own. Pick a FPL stat, a BPL stat and you can compare and contrast. The question I wanted to answer here was “Is there a relationship between FPL and BPL stats?” I can’t find any interesting relationships, but maybe you can.